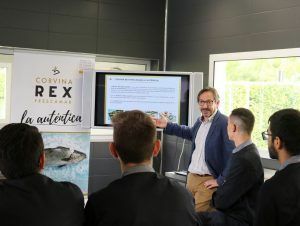 Corvina REX has become the leading product at GASMA’s kitchens these days, the Gastronomy and Culinary Management Campus of the CEU Cardenal Herrera University whose facilities are located in Castellón, just a few minutes away form Frescamar processing plant. Thus, through a complete masterclass orchestrated by the Director of Quality of the food company, Eduardo Soler, the students of the GASMA Master in Gastronomy have received theoretical and practical training about this traditional Mediterranean species that Frescamar has recovered thanks to aquaculture. The theory has included general aspects of this type of breeding as well as Corvina’s specific contents related to its quality, freshness, nutritional values, etc. On the other hand, a filleting expert from Frescamar processing plant has made a demonstration of manipulating and cutting before the watchful eye of the students, who have been able to put into practice what they learned by having a fresh corvina ready in front of each one of them for cutting. The Cardenal Herrera University is the first private educational institution of the Valencian Community that brings Gastronomy and Culinary Business Management studies to the classrooms. Frescamar, for its part, is a Mediterranean leader in the production and enhancement of Corvina, a kind of white fish that offers multiple culinary preparations: baked, salt crusted, grilled, roasted, sushi, ceviche, etc.